NEW YORK, NY and ROTTERDAM, THE NETHERLANDS--(Marketwired - Dec 15, 2015) - Have you ever lost your wallet? If you have, the security issues of a traditional wallet can cause irreparable harm in the form of identity theft, stolen cash, skimmed credit card data and more. The new Ekster smart wallet is the first trackable and secure RFID-blocking wallet that provides instant card access at the click of a button. Launched today on Kickstarter, Ekster's two-way tracking feature prevents you from ever losing your wallet or phone again -- and you're protected against any wireless skimming or identity theft. These features are held together by handcrafted genuine calf leather for a luxury look and feel. 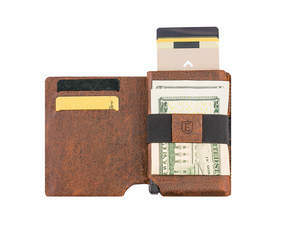 Ekster wallets' minimalistic design ensures durability and style. Users can enjoy NFC/RFID protection for five cards and store additional cards or cash in the extra pockets or with the removable multi-purpose strap. At only 0.35 inches thick, Ekster offers the slimmest solution to hold your belongings -- while also providing a hidden pocket for coins, keys and cards. "People aren't aware of how prevalent RFID skimming and data theft are -- and with Ekster, we are providing a fashionable, trackable and secure solution to these issues," said Olivier Momma, co-founder. "We've created an alternative to the traditional bi-fold wallet, so our customers can enjoy the fastest card access experience on the market in an ultra-slim design that maximizes storage and minimizes bulk. An item used so frequently has to be efficient, slim, secure and adjusted for users' daily needs. Ekster wallets provide storage space for up to eight cards in the Senate edition and up to 12 cards in the Parliament edition. Users can enjoy quick access for up to five cards with the click of a button using Ekster's spring-loaded mechanism. It's simple. Click the trigger, and the cards are immediately ejected without having to open your Ekster wallet. The tracker inside the Ekster wallet synchronizes seamlessly with your mobile phone via Bluetooth® Low Energy. Available for iOS® and Android™ devices, the PROTAG app can connect to your wallet -- providing two-way protection. You'll be alerted when you leave your wallet behind and can ring or locate it with the map function at the tap of a finger. Lost your phone? When pressing the reverse tracking button on your wallet, your phone will start ringing -- even when on silent mode. Ekster's crowd GPS network will help you find your wallet when out of range. When a PROTAG user is within range of your lost item, you receive a GPS update. Ekster's tracker battery lasts up to six months and is easily rechargeable using the slim, built-in USB port. Credit and debit cards issued within the past decade have RFID and NFC technology embedded in them. Cards with this technology can be activated and duplicated from a distance, causing security issues for important data like banking information. The traditional wallets are no longer safe to use -- and the Ekster wallet blocks out all signals with its aluminum cardholder, keeping users 100 percent protected against any data theft. Ekster smart wallets are now available for pre-order on Kickstarter. Early-bird pricing starts at $79 for the Senate model and $89 for the Parliament model in either coffee brown or black leather. The first wallets are slated to ship in May 2016. Please visit Kickstarter for all of the details. At Ekster Wallets, we believe that every component of a product must be engineered by specialists in that industry. That's why we work together with specialized partners, each of whom has built up their own reputation in their field over the years. Our partners are: Pezy Group, PROTAG Innova Technology, and Rubo Ledewaren. With offices in Rotterdam, Netherlands and New York City, Ekster Wallets maximize convenience and security with a first-of-its-kind smart wallet. To learn more, please visit www.eksterwallets.com or follow Ekster on Facebook, Twitter, Instagram or Pinterest. Pictured above, the new Ekster smart wallet is the first trackable and secure RFID-blocking wallet that provides instant card access at the click of a button. At only 0.35 inches thick, Ekster offers the slimmest solution to hold your belongings. The new Ekster wallet two-way tracking feature prevents you from ever losing your wallet or phone again - and you're protected against any wireless skimming or identity theft with its secure RFID-blocking feature. Best part? It's rechargeable!